For containment under tanks, vehicles, and machinery, the 12' x 50' x 1' H aluminum angle berm is the perfect choice. 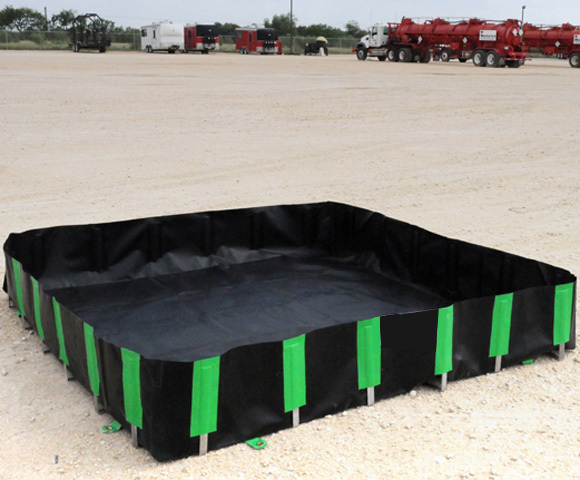 Great for containment of leaks, spills, and drips, these berms are often used under frac tanks to help successfully contain materials and prevent contamination to surrounding locations. In addition to this common size, Aluminum Angle Berms are available in a variety of other standard sizes, as well as custom sizing options. For more information regarding sizing for these spill containment berms, see Aluminum Angle Berm Specifications Page. We can help! Call our team at +1-772-646-0597 or fill out our quote request form to discuss your requirements.